Naperville, Illinois: The metamorphosis of a retail lumber building into a place that combines learning and fun offered the same experience to the design team. The first thing you see is a 35-foot-tall red door. 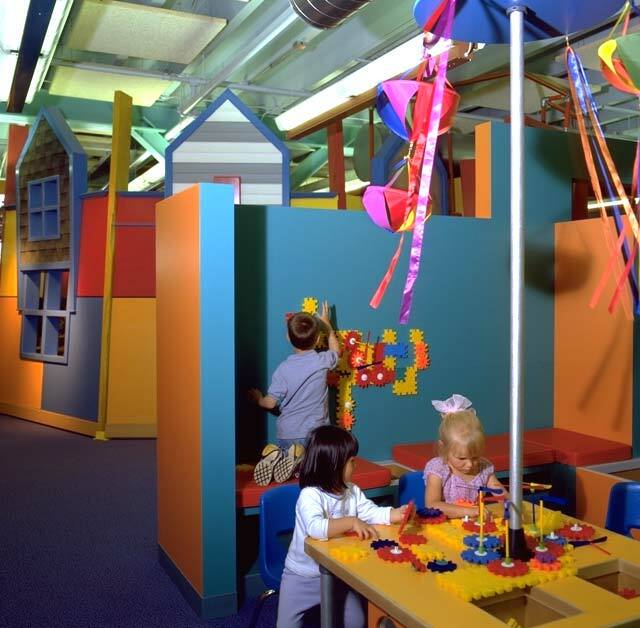 “It’s an emblem of what we stand for,” explains Susan Broad, the museum’s executive director, “because we are opening doors for children.” Since the DuPage Children’s Museum (DCM) was founded in 1987, it has been opening doors to family learning. It had a nomadic existence as it first moved from town to town and later to two temporary locations. The new 44,000-square-foot home for the non-profit institution is the former Moser Lumber building near downtown Naperville, Illinois. Attracting large numbers of families, the institution itself has grown, both in size and in mission, and is well respected for its original, innovative exhibit and outreach programs. “We encourage recycling and reuse with children, and liked the idea of recycling and reusing an existing facility,” says Broad. 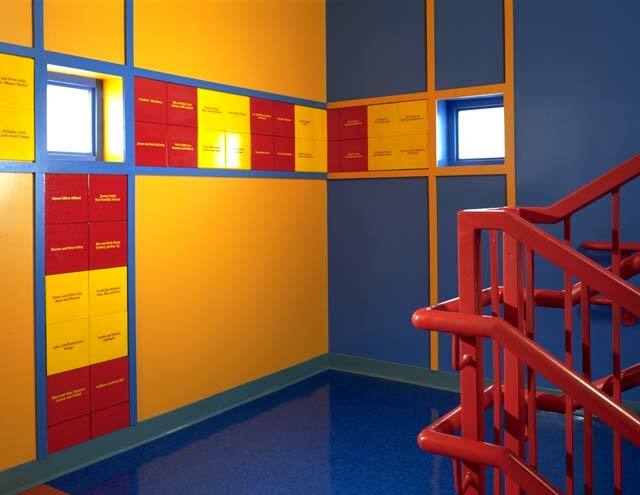 Transforming a commercial lumber company into a thoughtful and efficient children’s museum was not an easy task, but the collaboration between Peter J. Exley Architect/architectureisfun and Nagle Hartray Danker Kagan McKay Architects Planners Ltd. (NHDKM) combined the necessary talent and expertise required. “We wanted to create an identity to change the building from a retail lumber building to a building that plays an important civic role, owned by children and the people in their lives,” says design architect Peter Exley, AIA. The success of this collaboration is due in part to comfortable egos that allowed each firm to think for the good of the museum rather than their own design ambitions. Furthermore, the personalities of the Exley/NHDKM design team really clicked with the personalities of the museum’s design staff, making the project a great deal of fun. After all, that’s a lot of what a children’s museum is about. Working closely with both the museum staff and the City of Naperville, the design team developed a comprehensive master plan, which includes future growth, connections to mass transit, and complete accessibility for the disabled. Budgetary constraints, as well as administrative “growing pains,” dictated that the project be phased in order to achieve the museum’s long range goals. The recently completed Phase One renovation and build-out represents the culmination of five years of site acquisition, design, and building modifications necessary to convert the existing structure into an inviting and safe environment. The first phase was not easy. The long span structure required extensive reinforcing in order to meet the requirements for assembly occupancy. Similarly, existing stairs had to be rebuilt and an additional stair tower had to be added to meet the life and safety codes. Just as important as these pragmatic issues, great care and thought have also gone into the imagery and playfulness of the project. 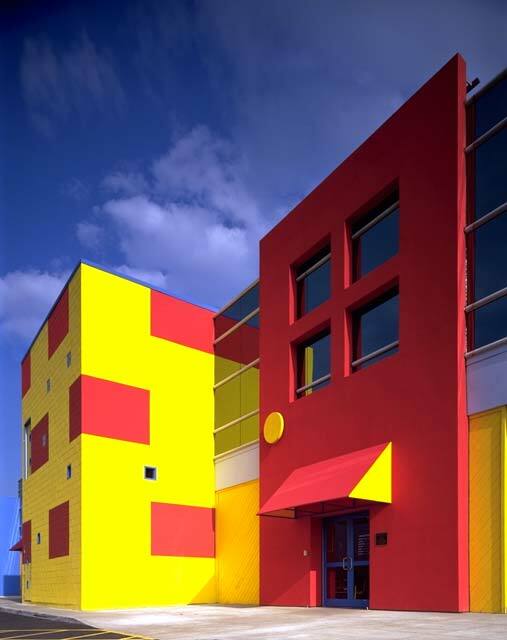 Recycled into something extraordinary, the building uses iconographic and symbolic elements children understand and appreciate. The Big Red Door, for example, welcomes all visitors and has become the museum’s new graphic identity. Face-to-face interviews with children and the important adults in their lives provided the impetus for the initial design. Children drew the new museum as they envisioned it. Their drawings helped in a remarkable way to clarify the master-planning framework as well as to identify some design details that appeared often in the drawings, highlighting just how important they were to the children. 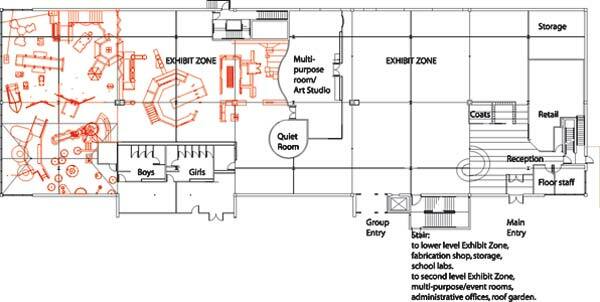 The design team also met with staff and outside arts, education, and science advisors – meetings which Exley calls “absolute consultation.” Design alternatives resulted for each floor, followed by in-depth communication about the museum’s future programmatic, operational, aesthetic, and design needs for young visitors. From kids’ drawings to delightful design, Phase One takes advantage of existing features such as high ceilings and concrete framing. The architectural and exhibit design overlap to add a lively sense of colors, dramatic variations in scale with places to see things from different perspectives, and personalizing the dynamic structure. New interior columns even reach like children’s outstretched arms propping up the building – the whimsical result of added bracing to the structural system. For an institution that kindles curiosity and creativity, it is critical that the architecture also provide stimulation and excitement. In a large building with a very limited budget, obvious ways to create flow and excitement are through materials, forms, and textures – the spaces and surfaces surprise and motivate. 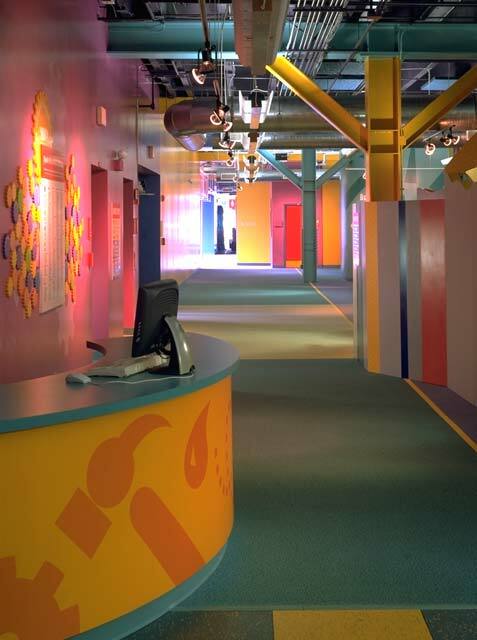 The design is child-like, yet sophisticated, and includes 20 different colors of paint, colored lights suspended in playful patterns, and a tactile wall that engages even the youngest children as they walk through the corridor. 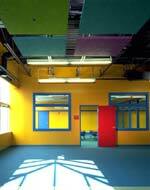 Creating a colorful, joyful environment shouldn’t impact the budget any more than a drab one. For the design team, it was important to approach the architecture and design with a cognizance for the people who will be using it. Because children are tough end-users, materials were chosen as much for their durability as for their color range. The new museum, arranged in “learning neighborhoods,” utilizes the dynamic palette and uncommon design details to clearly identify and distinguish the separate exhibit areas. 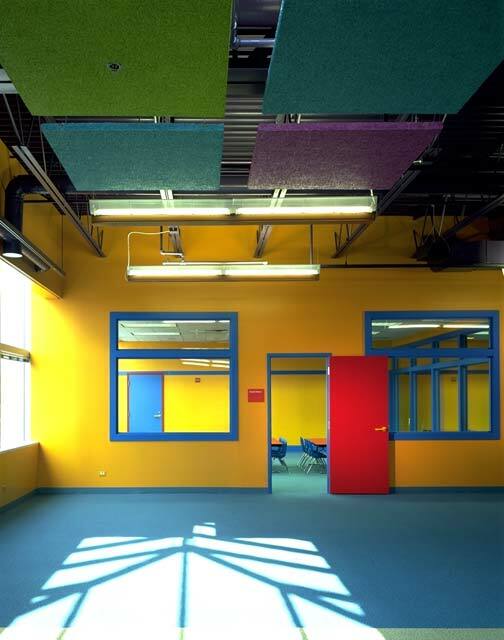 Eye-popping colors, from a pulsating lime to a “goober grape,” give definition and form to the engineering labs as well as the art, math, and science experiences. Children find their way easily from one zone to the next, and there are sweeping views allowing parents to keep a watchful eye. 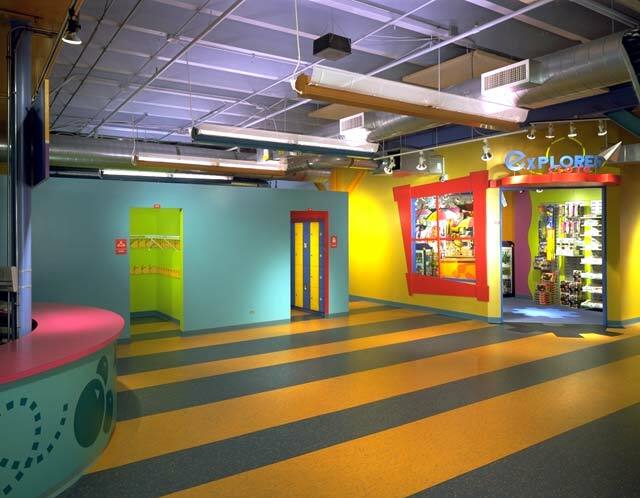 At the entry, the striped linoleum points in the direction of activity and fun. Any red door in the building is a welcoming one, an invitation to explore and to experience something new. A blue door, however, might have something secret hidden behind it, such as a storage closet or staff space. Even donor panels brought about an innovative, inexpensive detail. Made of brightly colored etched ceramic tile, these panels add color and shine to the hallway they line. 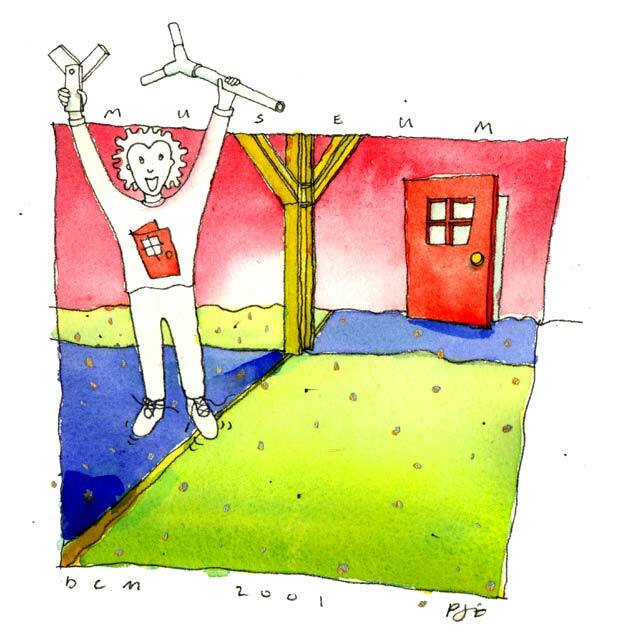 The museum is very interested in self-directed play. Many of the much-loved exhibits from the former location have been re-incarnated and some new favorites added. 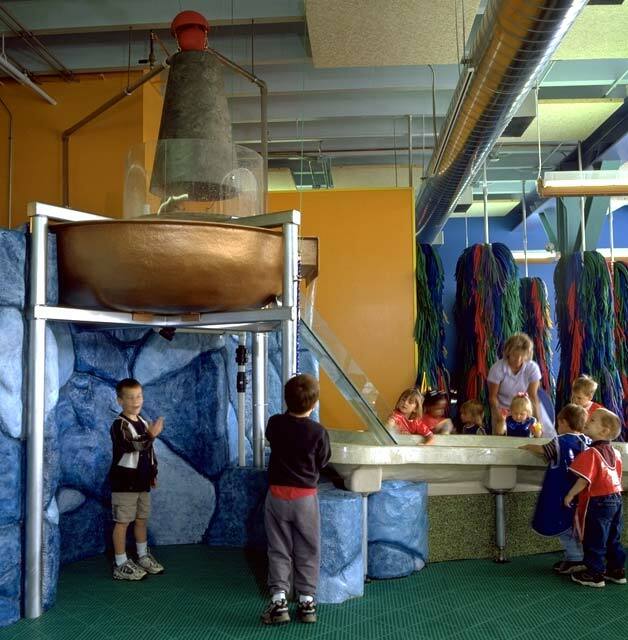 The exhibit zones, such as the Moser Construction House, AirWorks, WaterWorks, Bubbles, and Engineering Kids, clearly respect what children are doing and learning. Children are provided the space to build their own experiences – with safety in mind. Exley feels that the Construction House, for example, not only gives children the freedom to use real equipment (like nails, saws, hammers, and safety goggles), but also provides a safe environment and encourages safety skills. Lisa Notter, marketing manager for the museum, says: “We use nails – most museums think we’re crazy for using real nails.” In reality, the culture facilitated by the design and the educators who staff it instills a sense of responsibility and privilege – kids are thrilled to be given the opportunity to use real “grown-up” tools, and respect and attentively follow the “rules” of behavior necessary in the Construction House. 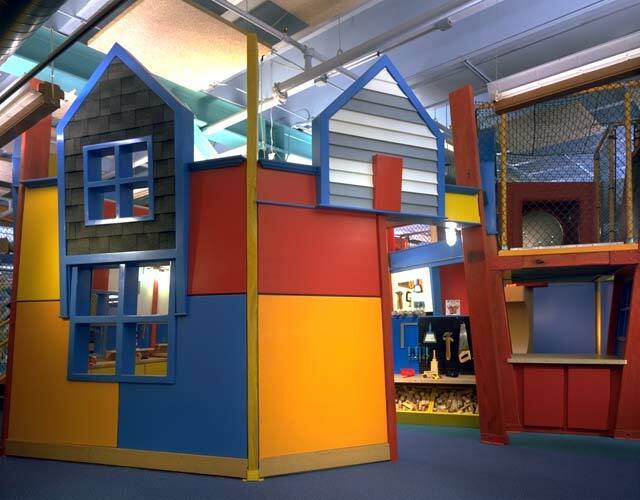 The interior of the Construction House was purposely left “under construction” to further the child’s understanding and exploration of building materials. A loft-like space allows children to finish off the roofing, climb up into the ductwork, and offers a different vantage point. 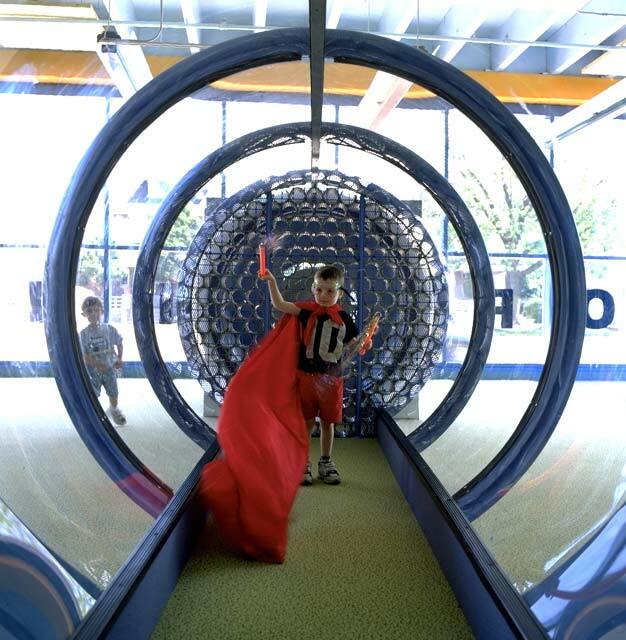 Large pipes also extend outside of the house so children can imagine forts, tents, or mazes to run through. Bubbles is a perennial favorite and typically a maintenance worry. Huge car wash brushes, like enormous totems, delineate the zone – and keep the bubbles where they belong. Children also love to wipe their hands on them and squeeze their bodies in-between two brushes, some of which were planned deliberately too close to each other. The concrete flooring and rubber mats are durable and easy to maintain. Children are blown away by AirWorks. 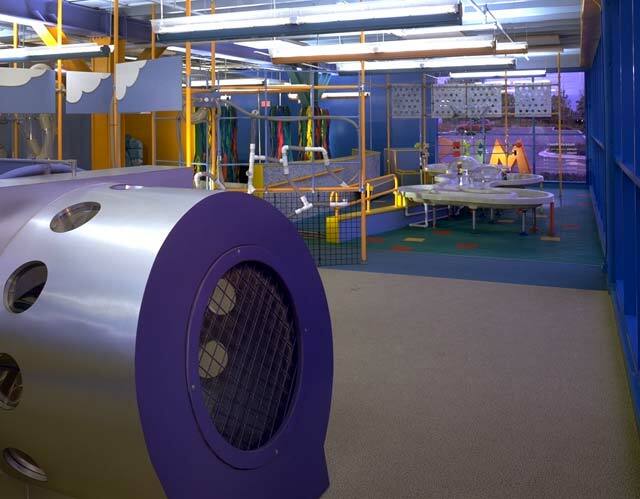 The 6-foot-diameter transparent wind tunnel allows air to become a force in a child’s life. 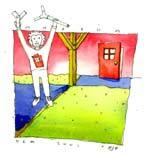 Outside the tunnel, everyone can watch the child experiment by throwing a Frisbee or by flying streamers and kites. In Make It Move, there’s a lot of pushing, dropping, rolling, and pulling going on. Children use energy and coordination to focus on the laws of motion. 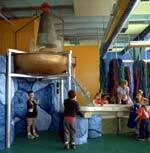 The Exley team designed inclined walls, climb-throughs, planes, and ramps to move bodies and balls through and around. Attendance has more than doubled – the museum is now welcoming more than 300,000 visitors. The building and integrated exhibits are a major factor in this increase. Phase Two will soon add another 20,000 square feet with a new entry and larger red door, additional exhibit space, an outdoor rooftop exhibit garden, and parking facilities. Note: The above firms collaborated on the building’s exterior and interior architecture and design. 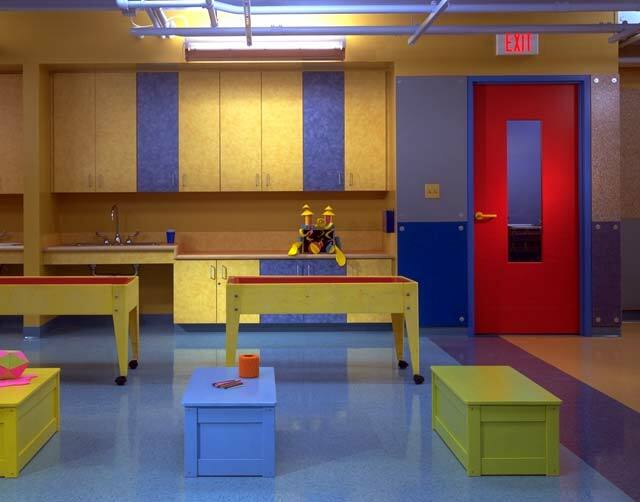 Peter Exley, AIA, and Sharon Exley are teachers, educative designers, and generators of good ideas; together they have amassed an impressive portfolio of interactive architecture and environments for children. Founded in 1994, their award-winning firm, architectureisfun, develops architecture, interiors, exhibits, and learning resources for clients interested in sensorial and enlightened experiences as part of daily life. Nagle Hartray Danker Kagan McKay (NHDKM ) provides a broad range of services related to architecture, interior design, and planning. Founded in 1966, the firm's award-winning design has included new and revitalized structures of virtually every building type. NHDKM's staff of 32 includes 19 licensed architects holding registrations in 12 states. Commercial, cultural, educational, and residential projects include Harpo Studios (Oprah Winfrey Show); the University of Chicago; Art Institute of Chicago; Spurlock Museum of World Cultures; multi-family and senior housing. Sharon Exley, MAAE, Partner, architectureisfun - Peter J. Exley Architect, consults on a regular basis to institutions such as the Art Institute of Chicago and Chicago's Museum of Contemporary Art; presenting family and teacher workshops. She is co-author of “The Best of Everything for Your Baby (Prentice-Hall), and writes frequently for design publications. 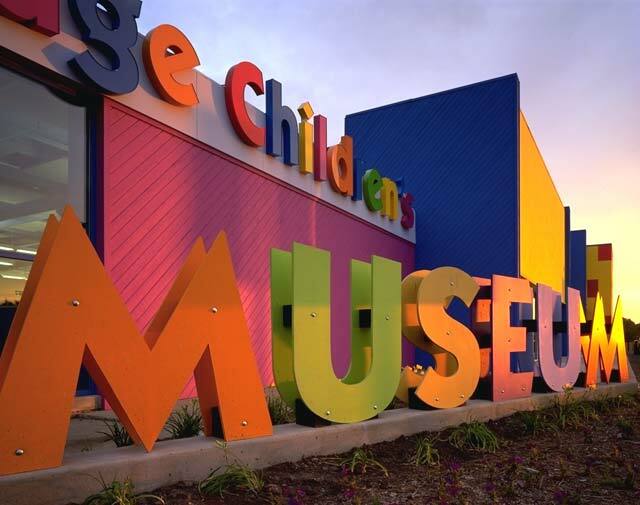 The DuPage Children's Museum raucously colored exterior signage signals there's fun to be had inside. The 35-foot-tall Big Red Door welcomes visitors and has become the museum's new graphic identity. The museum's structural columns create a fanciful forest of form and rhythm. Exley's charming column design resembles children's arms reaching out and holding up the building. 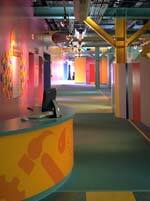 The colorful entry includes a retail store designed by Charles Sparks. The Moser Construction House provides real building materials and tools for constructive problem solving. 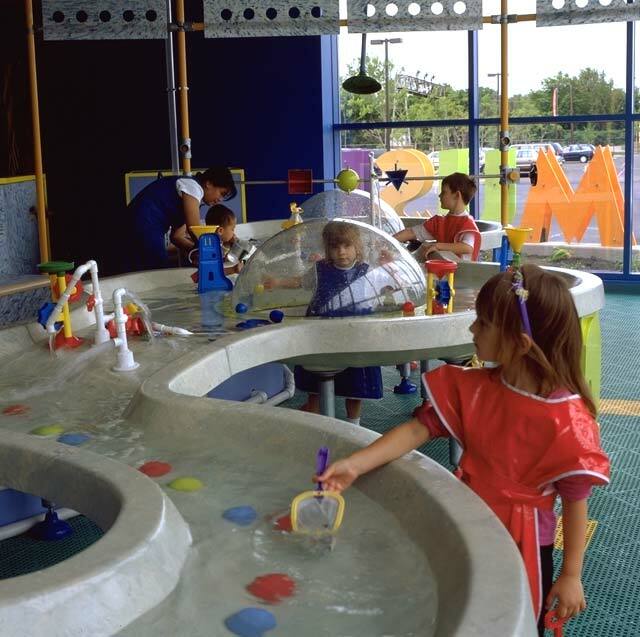 The "Sink and Float" water table provides a gentle sensorial experience for children and their caregivers. Emma pops up underneath the water table but manages to stay dry. 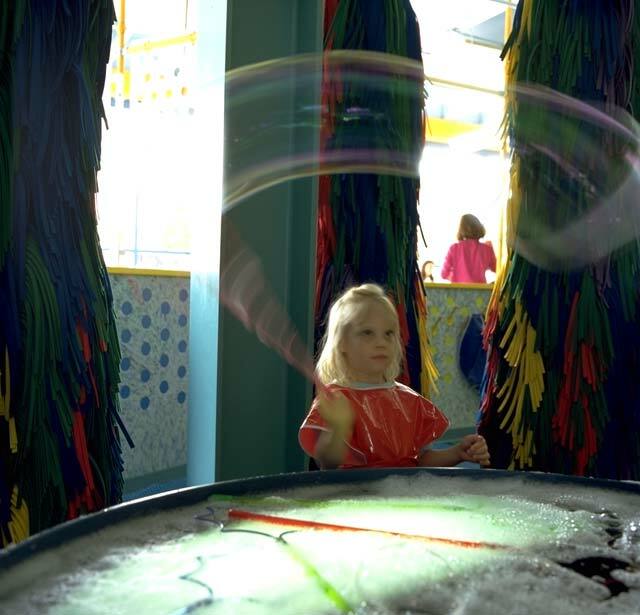 Children learn that water is a force in the "fantastic" Fast Flow table. 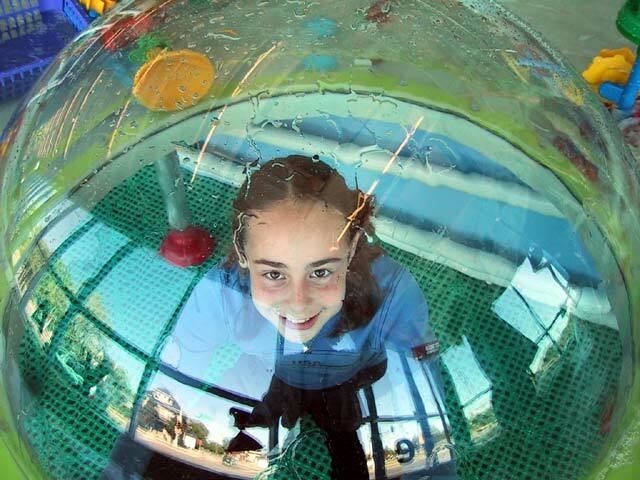 Kids can watch other kids being wind-blown in the transparent AirWorks tunnel. 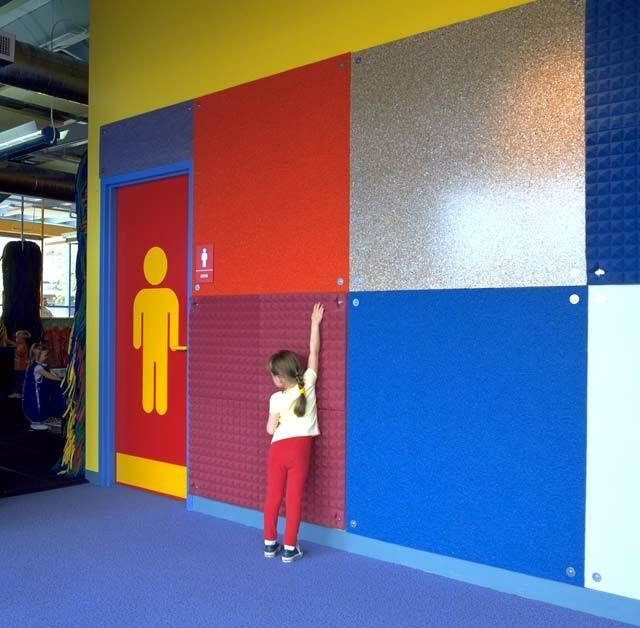 TacTile Walls around the museum use various types of recycled, magnetic, and acoustic materials. A circle of car wash brushes keep Bubbles where they belong. Children "Make It Move" by playing with ramps and rollers using "KIDnetic" energy. Make it Move: eye-popping colors, from a pulsating lime to a "goober grape," are used throughout the museum. 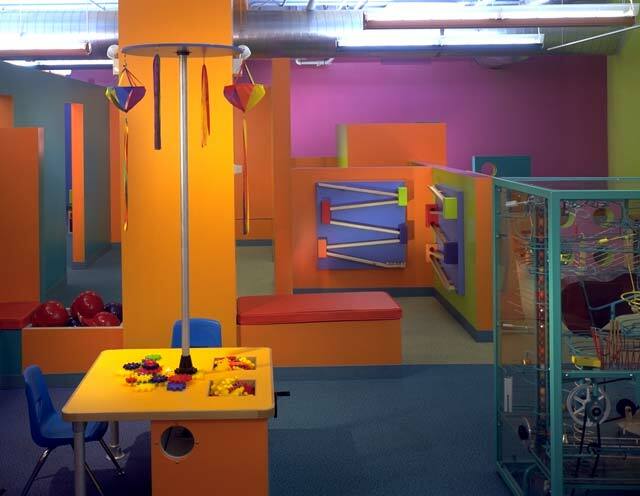 The Learning Lab is a powerful design and learning experience, incorporating multiple perspectives of designer, client, programmers, educators, and children. Overall view from the wind tunnel to the Sink and Float water table. The Donor Wall uses ordinary bathroom tiles etched with donor names and messages. A gathering spot perfect for events and rental, the multi-purpose room also works for changing exhibits and gallery showings.